Repeat offender claims to have a bomb to avoid arrest. Reyanon Duncan, 30, was arrested and charged with Receiving/Transferring a Stolen Motor Vehicle. You may recognize Duncan from previous arrests as she was branded the "Gym bandit." Duncan was arrested and charged earlier this year for being involved in several burglaries and auto thefts at various gym locations around Albuquerque. Duncan was finally caught, arrested and booked in connection with numerous crimes after a Grand Jury indictment for these crimes. 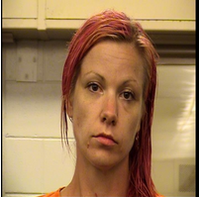 She has since been released from custody and was caught again today by the Albuquerque Police Department. An officer working routine patrol located two stolen vehicles in the parking lot of a motel located at 25 1/2 Hotel Circle. As the officer was completing the recovery process of one of the stolen vehicles, Duncan was observed exiting a motel room and occupied the other stolen vehicle. Duncan was arrested and two others subjects in the motel room were detained. Duncan was found to be in possession of a firearm and claimed there was a bomb in the motel room. Officers evacuated the motel and were able to clear the motel and determined there was no bomb or threat to the public. During the time Duncan was in police custody she told officers she was pregnant and needed to go to the hospital for pain. While she was at the hospital being checked by hospital staff, she managed to gain access to the ceiling and exited the ceiling where officers were standing just outside of her exam room. Duncan was taken back into custody and will be booked into the Metropolitan Detention Center. Duncan is a repeat offender, a flight risk and a danger to the community. The Albuquerque Police Department did an outstanding job taking another repeat offender off the streets.